The sights, the history, the ingredients and the recipe! It is true that not all the adventures are to be sought far away. One can simply come in Valtellina to discover the Pizzocchero, the traditional pasta of these valleys! But first, I want to know more about the historical aspects of this place. I’m in Teglio, where the tower is the symbol of the city and of everything that remains of the massive walls that used to surround it. This place names the whole valley: indeed Valle Tellina derives from Teglio. However, there is one thing that not everybody knows; this valley was known by the Etruscans and frequented by the Lunis. Therefore Teglio has a very ancient story. During the excavations of the Church, they found some byzantine remains, even thought the part that faces the street was built in XVI century, when there was still the order of the Whites. The Whites was an order of monks dressed in complete white who wore tunics and hoods over their face. They did the so-called macabre dance, which is still painted on the church’s wall. Anyway, I am here for Pizzoccheri, I can’t forget it, so I reach the old water mill of San Rocco di Teglio, passing through a wood with its autumnal colours. The Menaglio mill was renovated by the local Accademia del Pizzocchero, and it is perfectly functioning: here they grind the main ingredient for Pizzoccheri, which is buckwheat, whose flour is called Furmentùn. The precious buckwheat, originating in Asia, spread in northern Europe around 1300/1400 and then came in Valtellina between 1500 and 1600. Nowadays buckwheat is still grown in some regions of northern Italy, and it is appreciated for its peculiar characteristics: it is gluten-free so it is suitable for celiacs and has a very unique flavour. Actually, if you look at the ear you will notice the difference with grass plants: buckwheat doesn’t have a single spike, but a polygonaceae one (it makes a kind of pendant bunch). It had less fortune than traditional wheat because it yields 10 times less for equal quantity of cultivated land, so it is quite rare, but also rich in healthy nutriments… A real treasure! I witnessed to the act of grinding: the young miller started the millstone, which of course is situated near the river. The force of the water turns the wheel, but it is not as easy as it sounds. There is not a on/off button to get the work done, but that’s how their daily bread is made! The saying ‘Chi va al mulino s’infarina’ (literally ‘Who goes to the mill gets covered in flour’, meaning you can’t undertake certain activities without getting fatigued because of them) if taken literally is actually true: I left completely covered in flour, an impalpable flour that fills the air! Now that we have the flour we can have Pizzoccheri! However, in order to eat them you have to make them. Rosa, whose surname is Rosalba, is a cook of Teglio and she taught me how to make them. Here’s the recipe (ingredients for 4 people): 400 grams of buckwheat flour, 100 gr of white flour and water. A potato cut into pieces that should be put in boiling 5 minutes before you put the Pizzoccheri, and then left there to boil with them. Then you add the cabbage more or less at the same time you add the Pizzoccheri, a large amount of garlic browned in a large quantity of butter. Then abundant Casera cheese and, to top it off, also some Grana. Then your throw the Pizzocheri in the boiling water. Drain the Pizzoccheri together with the potatoes and cabbage, and season with cheese and melted butter. They are enough for a main course, a second course and a dinner, but it was truly worth to see how they are made and to eat them here at the mill. They’re worth the trip, long live the Pizzocchero! Slow Tour: adventures in Valtellina! the traditional pasta of these valleys. it’s all that remains of the large walls that once surrounded it. Tellina Valley derives from Teglio. Teglio has an ancient history: the White Friars’ Oratory in the historic town centre dates from the 15th century. with the white hoods covering their faces. They would perform the so called danse macabre. The church in Teglio is really old and excavations have brought to light some Byzantine artefacts. and there were still the White orders. But I’ve come here to see the old watermill in San Rocco di Teglio. The Menaglio mill has been restored and is in perfect working order. This is where they grind the main ingredient for the pasta known as Pizzoccheri. in this wonderful mill which still produces flour. The flour is called Furmentùn. It’s the precious buckwheat that originated in Asia. and its use spread to Valtellina between the 16th and 17th centuries. it’s gluten-free therefore suitable for celiacs. It also has a very unique flavour. Can you see the difference? The grass-like plants have only one ear. This is a polygonaceae and only has a hanging cluster. On an equivalent area of land buckwheat yields 10 times less than traditional wheat. And precisely because it is rare and so full of healthy properties, it’s a real treasure. The time has come for grinding and Andrea the miller starts up the mill. it’s not that easy, there’s no on/off switch! …And this is the daily bread! I’m all covered in flour! As the proverb says “he who goes to the mill gets befloured”. Now let’s go and eat some Pizzoccheri! But before we can eat them we have to make them. Rosa Rosalba from Teglio will teach us how to make Pizzoccheri. 100 grams of 00 white flour. Rosalba mixes the water, the buckwheat and a small part of the 00 flour. Can I do some kneading? Can you show me how to do it? It’s time to make a sheet of dough. 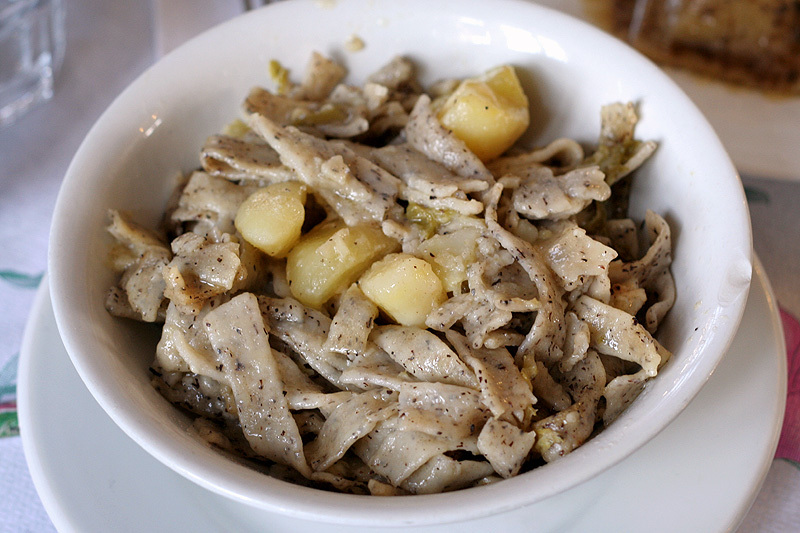 You need to know how to make Pizzoccheri here, otherwise you’re nobody. Rosalba couldn’t wait to get kneading. How lovely that thing is. What did you just do? Wonderful, they can’t get any better. So now we’ve made the Pizzoccheri, what about the dressing? so that it can boil with them. …but we mustn’t distract her! A large quantity of garlic that has been browned in lots of butter. and there’s also Parmesan cheese. It’s time! The Pizzoccheri are put into the water. This is a delicate moment, the product must never be left in the hands of someone inexperienced. Having drained the Pizzoccheri along with the potatoes and cabbage, it is all dressed with the cheese and butter. it was worth it, and so was the trip.